Are you ready for a 6 mile extreme bike ride in the Columbia River Gorge area? If so the Larch Mountain Loop has what you're looking for. Take the Gorge Scenic Highway to the junction between the Women's Forum overlook and the Vista House at Crown Point to get on Larch Mountain Road. From there you'll travel up 14 twisty miles to the parking lot where your Larch Mountain Loop biking journey will begin. 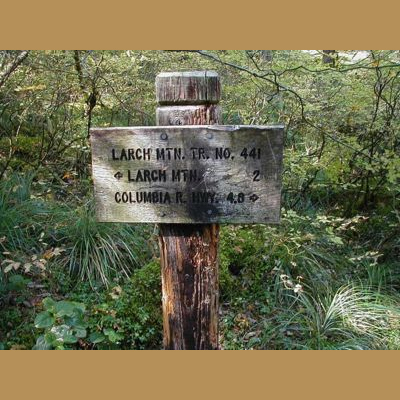 Learn details about the Larch Mountain loop below. This is a steep up-and-down loop, with fast turns and bumpy roots and rocks. The loop starts at the top, so you get the descent before the climb out. The bike-legal loop is Upper Trail 441, Trail 446, and Upper Trail 424, and you can also do the Trail 444 cutoff, which is extra-technical. Be sure not to go below Trail 446 on either Trail 441 or 424, as those sections are not open to bikes. Also be sure to catch the view at Sherrard Point while you’re there.